Daredevil made its grand return this past weekend, setting up a fallen Matt Murdock against his grand nemesis from the first season, the Kingpin, in a battle for Matt’s soul. 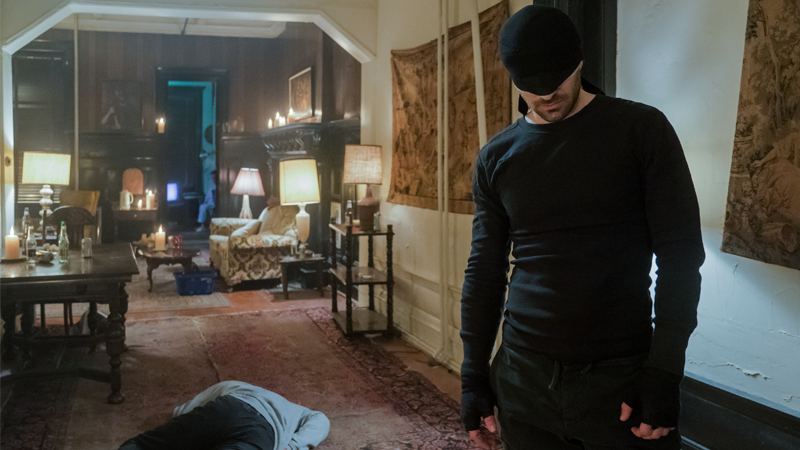 Overall it’s a season that tackles the familiar Daredevil themes of the rights and wrongs of vigilantism—but here’s a few things in particular we liked and disliked. 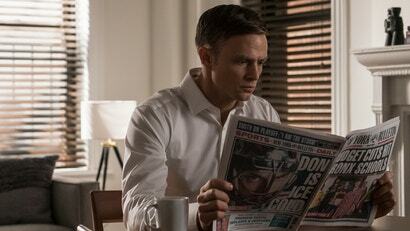 One of Daredevil’s “joys” as a character is that, on the page and on the screen, he’s almost comically miserable. Whether it’s literally everything that has ever happened to Matt in the comics or the show’s seemingly endless Catholic guilt, Matt Murdock almost exists to suffer. This is something Daredevil’s third season deals with in spades, given that it carries on from The Defenders’ climactic act of literally dropping an entire building on him—but it does so in a way that not only mines that misery for some great moments, but also leaves Matt in a way that feels at the least considerably happier than he’s been since the show began. On the misery front, the second episode of the season, “Please,” is an absolute highlight of Matt at his lowest. 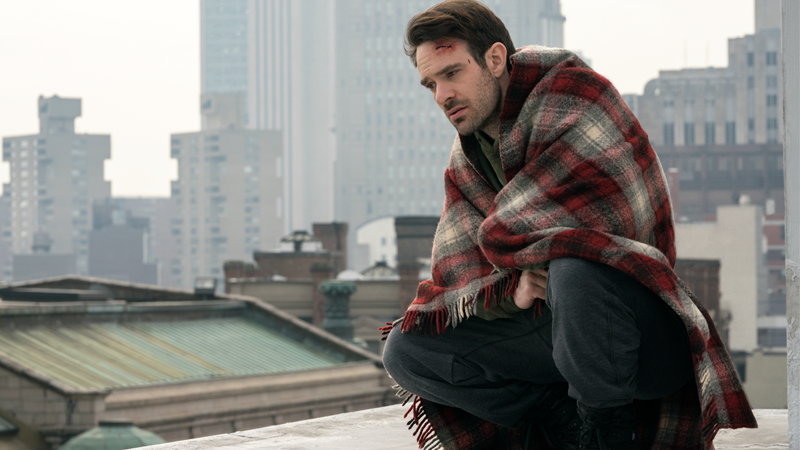 He physically struggles with the aftereffects of the whole “a building dropped on him” thing while also questioning his fraying relationship with his faith—drawing a stunning performance from both Charlie Cox as Matt and Peter McRobbie as Father Lantom. But it’s an internal conflict that gets to simmer over all of Daredevil’s third season, eventually culminating in Matt’s final re-confronting of Kingpin, a battle that leaves him closer to Karen and Foggy, and back trying to have a semblance of a life outside of being the Devil of Hell’s Kitchen. Now that he’s truly taken on his comic-book subtitle of the Man Without Fear, it’s probably not going to last—this is Daredevil we’re talking about, after all—but it felt like a worthy narrative, tying up elements that have lingered in Matt’s growth since the very first season. Karen has been through the wringer over the last three seasons of Daredevil, from being framed for murder, to committing it. The bulk of her time in the show—and companion series The Punisher—is spent trying to uncover truths and not be murdered. But season three finally dug deep into her past and gave her journalism storyline some realism. 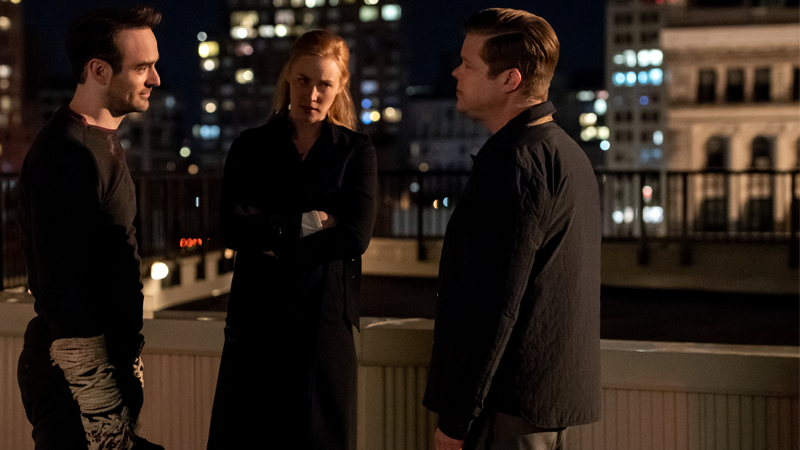 “The Devil You Know” had a wild fight between Daredevil and Fauxdevil but that wasn’t what will stick with us from that episode. Rather, it was Fauxdevil’s murder of just about all of Karen’s colleagues. We’re not sure when the idea for that scene came about, but it is all too close to the real-world shooting at the Capital Gazette earlier this year. Karen’s foray into journalism never sat quite right with us, but her perseverance to uncover the truth despite what happened at her workplace rang true, and Deborah Ann Woll gave the performance the weight it deserved. (The scene with all the cell phones going off in the evidence bags absolutely wrecked us.) Despite all the danger she was in this time around, it was a relief the series didn’t feel the need to follow through on Karen’s comic book storyline and kill her off too. Daredevil’s action has only gotten better as the show has evolved, but for all the ninja-tastic spectacle of season 2's fights, they were missing some of the symbolic, story-driven spark that made the first season’s fight scenes so compelling in the first place. Two fights in particular stand out the most in season 3 (although, shout out to the very cool Daredevil/Fauxdevil fight between Matt and Dex in “The Devil You Know”). The first is the now-traditional one-shot take on a “hallway fight” that came in episode 4, “Blindsided.” It’s a gruelling and visceral epic-length slog as Matt tries to escape a prison-bound trap courtesy of Fisk that is as enthralling to watch as it is exhausting to even comprehend, a sequence (11 minutes long!) 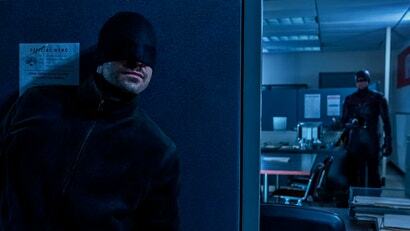 that truly exemplifies the grit and determination that makes Matt Daredevil, to the realisation of Fisk himself. The other is the less-immaculate but equally weighty three-way scrap between Fisk, Matt, and Poindexter, not only because of the hectic, messy vibe the fight is given by having three wildly different characters with different motivations being mushed together (speaking of things being mushed, ouch, Dex’s spine), but because of how it ultimately leads to the crisis of faith in Matt’s struggle over whether or not he can end Kingpin’s life as a redemptive act. We’ve always loved Daredevil’s grit, but it was nice to see that grit serving a bit more than just flashy moves again. If your only familiarity with the Marvel Comics villain came from the 2003 movie starring Colin Farrell as Bullseye, this was...uh...not that. Thank god. 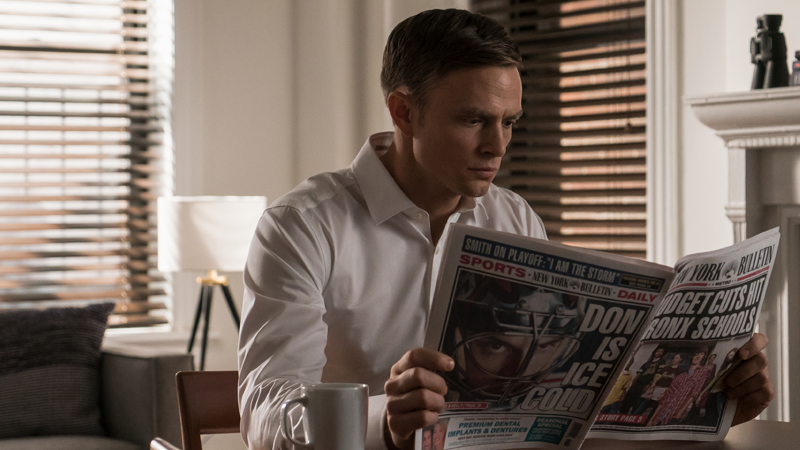 Our could-have-been Captain America, Wilson Bethel, plays Benjamin “Dex” Poindexter, an FBI agent who is all-too-easily swayed to the dark side by the allure of Fisk. Why? He was already dark. Super dark. In a revealing flashback episode we find out three very important things: 1) Dex started killing at a very young age; 2) he has an acutely accurate aim; and 3) his psychiatrist was his anchor. And then she died! While the scene’s mock-stage set up rubbed us the wrong way, it was an interesting change in pace for the series that gave us a very clear look at what was driving this character. 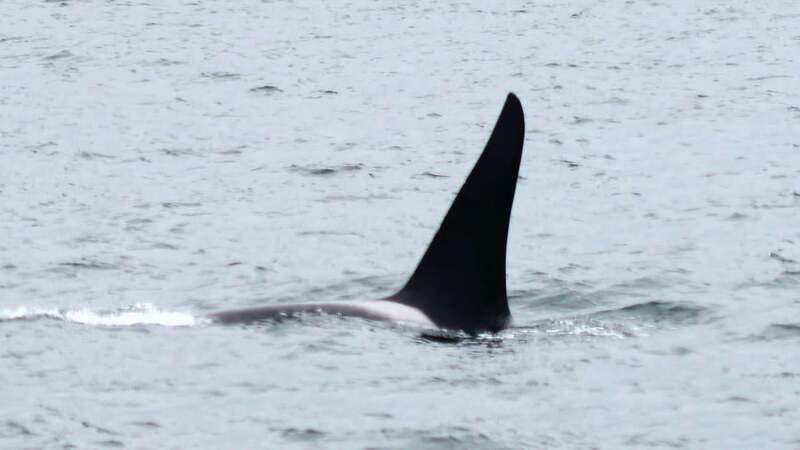 Sure, he was law enforcement, but only until they abandoned him too, leaving Fisk to fill that hole to structure his life. We do not believe this is one of those “bad guy can be redeemed” stories—his insistence that he was not stalking Julie was laughable—but an interesting reflection on just how close heroes and villains sometimes sit. 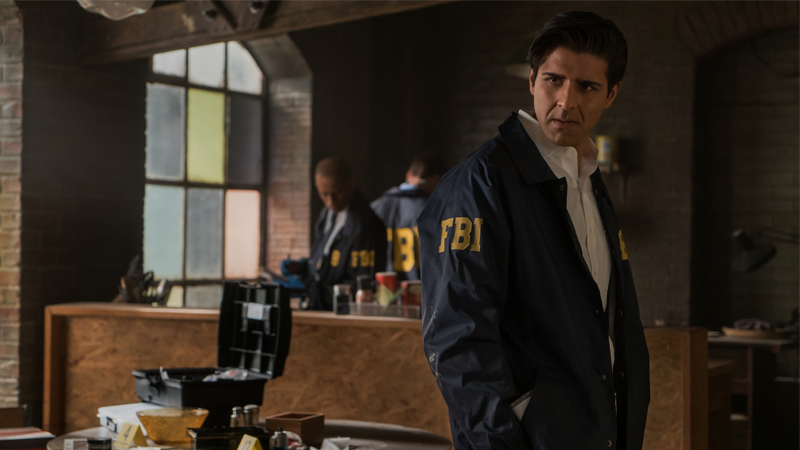 Two FBI agents have a big part to play in Kingpin’s grand plans: the aforementioned Poindexter/Bullseye, and poor Agent Ray Nadeem, who finds his life slowly destroyed from the outside in by Fisk’s machinations. Jay Ali does a delightful job in the role—and Nadeem is probably the best the MCU/Netflix universe has had so far, in a take on a law enforcement authority helping out our vigilante hero. 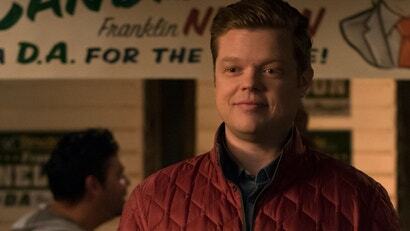 But in a season that was already giving a lot of focus to Fisk’s rapid corruption of Dex, adding in Nadeem’s own push under Fisk’s thumb felt like a bit of a repetition, even if Nadeem did at least get to redeem himself before his untimely death, handing over the evidence that would ultimately return Kingpin to prison. If Bullseye wasn’t such a major portion of season 3 already, Nadeem would have been a compelling ally-turned-antagonist-turned ally, but alongside him it feels like a bit too much of an unnecessary duality. Speaking of Fisk, we know he’s meant to be a criminal mastermind, but his increasingly elaborate plan to enact vengeance on Daredevil feels a little too mastermind-y for its own good. 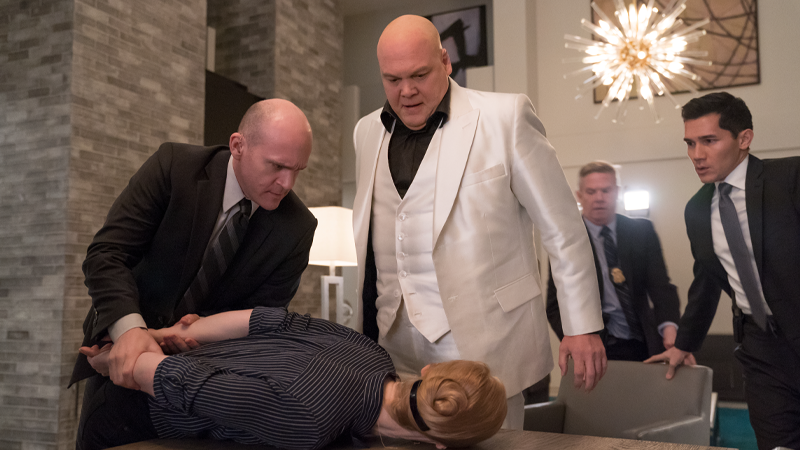 Even if Fisk has had plenty of time in jail to stew and plot, the immediacy with which he manages to bring people under his influence, to pick apart Matt’s life piece by piece, feels more like the unstoppable march of the plot dictating the action more so than it does the sinister plans of Fisk slotting into place as they did in season 1. Especially when it comes to unexpected elements like Dex’s arrival on the scene and Vanessa’s own increasing involvement in Fisk’s criminal activities. Sure, it’s the latter that eventually seals the deal to put Fisk back in jail, when Matt reveals he knows Vanessa hired the hit on Nadeem rather than Fisk, but aside from that one weak spot everything else at times could feel a little too slick in Fisk’s favour. Oh, Foggy. You’re great! 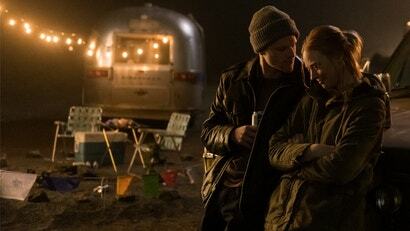 But you’re pretty dull, all things said. This season attempted to fill up Foggy’s dance card a bit by letting us see more of his family, his romantic relationship, and career, but none of it really made much of an impact. And when you compare his season to Karen’s, there’s no comparison. His run for District Attorney could have placed him in a much more interesting position for next season (if there even is a next season, given the sudden ends of both Luke Cage and Iron Fist recently), but even that fizzled out after barely gaining traction. Foggy needs a Thing. Let him have a Thing! And don’t say it’s Matt. You know how upset Matt was over Elektra’s death at the start of the season? How much moaning he did about it? He just...moved on. To be fair, it took a few episodes of whining, but once he had Fisk back on the brain Elektra and those bizarre events at Midland Circle were completely forgotten. Whatever. We’re sure she’s fine. Sister Maggie was great. Joanne Whalley’s dry delivery was everything. Someone to tell Matt he’s being an idiot is always welcome. Which is why it was so bizarre when Sister Maggie prayed out loud her big confession: that she’s Matt’s mother. Not only did she do this out loud, she did it after previously establishing Matt can hear literally everything happening in the church above him. OK, mum. Living in New York City is not cheap! 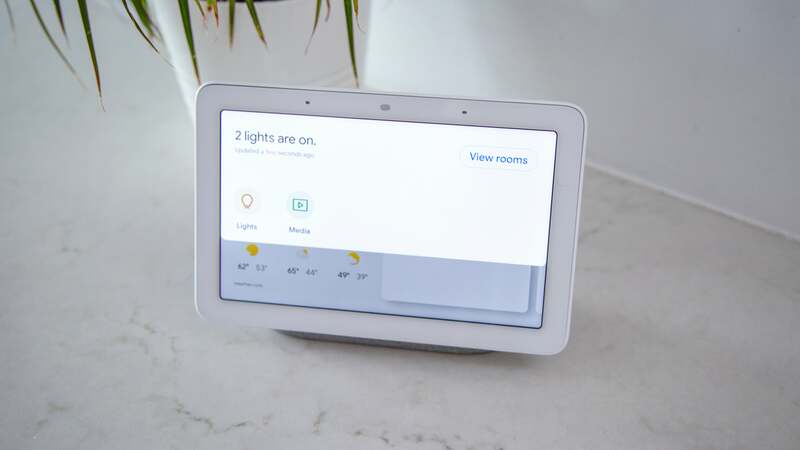 Some people have the mistaken impression that employers here give a cost of living salary compared to the same job elsewhere. You’d be mistaken. Which is why it was so bizarre to find out Karen-I’m-a-Low-Level-Reporter Page was covering Matt’s Hell’s Kitchen rent for months. She doesn’t even have a roommate in her own apartment, you’re telling me she’s carrying two NYC rents on a journalist’s salary? This is perhaps the most unbelievable thing in any of the Marvel Netflix superhero shows ever. And we know Iron Fist season one exists!